In the village of Cordes-sur-Ciel in France, there is a wonderful patisserie at the bottom of the hill called Maison Moulin. 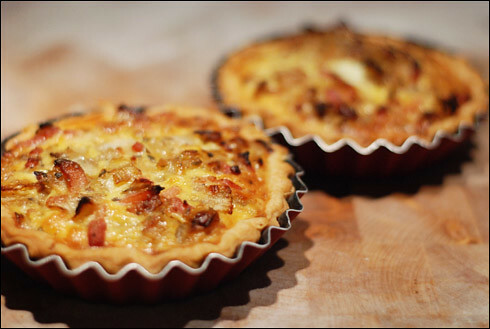 Their speciality is sweet pastries and gateaux, but they also do a few delcious savoury treats, my favourite of which is their tarte aux oignons avec lardons (though they also do a divine tarte aux poirons). As I am in London, just popping down to the bottom of the hill is impossible, and I will have to wait until my next trip out there for the real thing. However, I decided to take a stab at recreating them for myself. These are slightly more rustic than the Moulin version, but my other half (who is also familar with the delights of Moulin) has tasted these and proclaimed them "a good match for the real thing". I have made two versions - one large, round version, and individual little tartlets. They are both equally good, so I'll leave it up to you which version you go for! Serve with a fresh green salad and a cool glass of white wine. Chop the onions then gently fry them with the mixed herbs until slightly caramelised and golden in a large frying pan with a tablespoon of oil. Transfer them to a sieve to drain out any excess liquid, then in the same pan, fry the bacon until cooked and tender. Add the bacon to the onions in the sieve to drain out any excess liquid from them too, then mix the bacon and onions together. Mix the eggs, crème fraîche, parmesan and a pinch of salt and pepper together in a mixing bowl or jug, then roll out the pastry to about 2mm thick and line either four 10cm fluted tins or one 24cm fluted pastry tin. Prick the pastry with a fork then line the pastry with greaseproof paper. Add baking beans to weigh down the pastry, then bake in the oven for 15-20 minutes at 200°C. Once the pastry has baked, remove the baking beans and greaseproof paper, let sit for a couple of minutes then spoon in the bacon and onion mixture. Finally, pour the egg and crème fraîche sauce over the onions and bacon so it is just covered and bake in the oven at180°C for 25-30 minutes. Delicious hot or cold!